You are invited to be on the crew of one of three canoe expeditions through the Lower Canyons of the Rio Grande. Each run downriver is almost 100 miles long and spans 8 days and 7 nights, traveling every day and passing through spectacular canyons some over 1500 feet high…warm, sunny, gentle rapids, hot springs, unusual birds, desert wilderness solitude, safe, camping, archeology, mesquite campfires, slot canyon side hikes and the zodiacal cloud. The sixth annual Bushcraft and Paddling BWCA Seminar/Trip is over and it was a great experience. You never know what you are going to get from the northern sky in October. This year the first six days were August-like: warm, calm, bugless and clear. We even went swimming a couple days. A wee bit of snow and wind came the final day so we set up the “hot” tent and fired up the wood stove, but more for fun than necessity. The crew also had the opportunity to safely practice paddling in wind and waves. 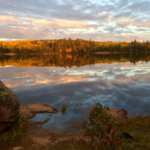 I have never seen the water so high in the BWCA in October which enabled us to dodge a couple portages with some whitewater paddling and to view robust waterfalls framed in peak autumn colors. No moose this time, but great views of five mink, an otter and a couple dozen swans.